Chris Samnee: Black Manta... Wilson-ized!! When I recently raved about The Anchor I completely flaked on giving the colors their proper due. An unfortunate side-effect of little sleep and composing blog posts too early in the morning. The colors really helped to sell the mood of the book and give everything that extra push into the realm of super-crazy-awesomeness that made my reading experience so enjoyable... and that's all thanks to the über talented Matthew Wilson. Matt has bowled me over with his ability to work in/with a number of different styles and artists. I'm really looking forward to seeing what he does next. Be sure to check out his work in everything from Wolverine and S.W.O.R.D. to Die Hard or End League. 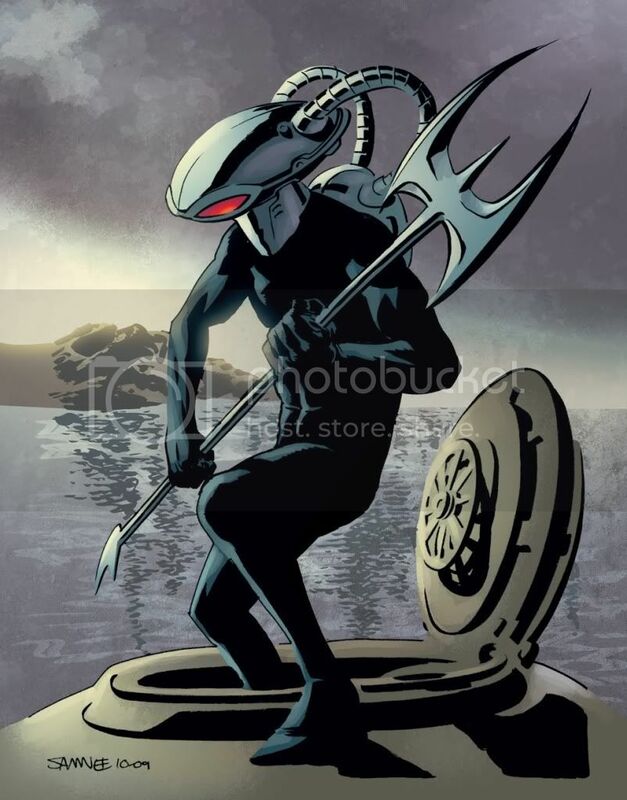 Matt was even kind enough to take ask if he could take a stab at coloring the Black Manta sketch I posted a while back. Looks great, Matt! Thanks a bunch! Holy crap on a hat that's flipping awesome. Matt is an insane talent which is nice to see that other people are noticing. consider me floored, that looks great, I like that he doesn't rely on showy effects to make a piece look great but just accentuates what is already a great piece with subtle colors and great craftsmanship, I wish all colorists were this good. Really awesome. You guys should make a print of this. I'd buy one. @skro: I'd be down if Chris would be. Manta might need a little more love before he's ready to see print, but a print would be pretty sweet! Yeah, this rules. Great job, Chris and Matt!